To help you, there is a tiny tool called BootIce. It is a standalone application for Windows and does not require installation. 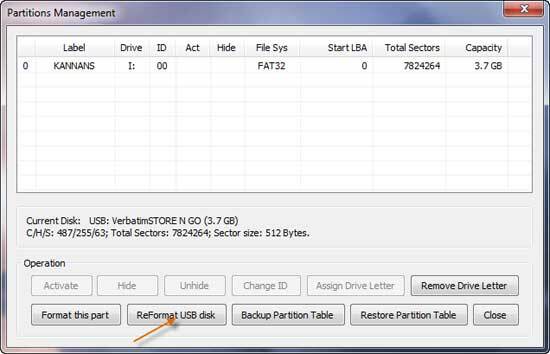 Here is how to use it to restore lost space of your USB disk. Download the Bootice RAR file and unzip it. Insert the affected USB drive in your PC and then run the BootIce (as BootIce needs formatting permissions, you may require administrative privilege to run it). Select the destination disk (affected USB disk) and click on the Parts Manage button. A new window will open up, there you can see different portions and parameters. 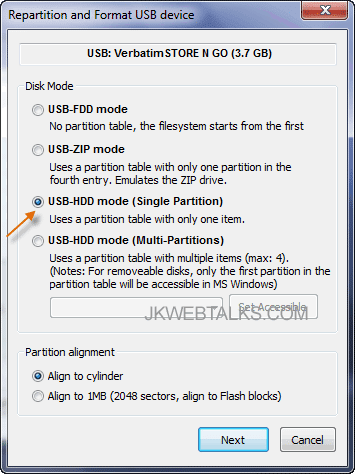 Click on the ReFormat USB Disk option and select USB-HDD Mode (Single Partition) option (see screenshot below) from the list. Keep the ‘Align to cylinder’ option checked and then click the Next button. Now a small window will pop-up. Choose the formatting option (FAT32 or FAT16) and click Ok to proceed. Note: Most of the USB disks usually come with FAT16, so you may choose FAT16. If everything goes fine, you will get a congratulations message. Now check the USB disk capacity in the Windows Explorer. It should be restored back to the original full capacity. Really awesome tool. It's working and I regain my 4GB Sandisk. Thanks for sharing. didnt help for me after clicking Parts Manager didnt show up anything there ! @Dear Anonymous, I think space of your USB drive has lost because of unsuccessful burning of ISO file, especially Linux OS. However, if you did not find anything after clicking ‘Parts Manage’ button, still you can proceed with clicking ‘Reformat USB Disk’ option. It will regain lost capacity of your disk. BitDefender do not allow to do all explained above. It says: Program was terminated, because of virus. I was about to give up on 3 thumb drives that are all back to normal thanks to your advice! -- Try to know you better, and keep in touch. try using "HP USB STORAGE FORMAT TOOL".. google it..
you saved my 4GB kingston pendrive! Great program,1GB restored to 4GB in no time.. Thank you for this! BAM! This little utility rocks! What would we who don't know how do without those that do know how? Thanks a lot for your great help. i lab u man.. it helps me a lot~!!! I could not be more grateful! Also, I can vouch for the results when fixing an unsuccessful iso burning, for anyone else coming across the problem. Worked awesome- thank you very much! thank you very much..worked awesome..my usb flash drive is going down to 2GB..and it restore to original capacity at 8GB..thank you so much.. greatful!!! !thank you so much...my usb flash drive is going down to 2GB,restored to original capacity 8GB..thank very much...!! I followed your directions and my 8 GB drive still reads 494MB. worked on imaton swivel pro restored the 2 gig. well done. I followed your directions and my 32 GB drive still reads 476. Thanks a lot man, there was a different way that I tried to do but it was complicated and didnt work, thanks again restored my usb from 4GB to 8GB. Thank you so much - it helped me. Nice post JK. WOW! I had my doubts but it worked...Thanks! Thanks a lot ! and unlike most of the articles you read on line all of the attachments work, the instructions worked and yes it actually did work ! SetVolumeMountPoint failed: The parameter is incorrect. Thank you so much! It restored my 16gb sandisk, it had been reduced to ridiculous 517mb! You are great!!! I think it is very effective post for us. Thanks for this nice and Helpful post. There is exciting moderately nice about the "Restore Lost Capacity Of Your USB Flash Drive". I like the suggestion. I want to share some information about it. I HAVE BOOT THE UBUNTU OS IN MY TOSHIBA 16GB PEN DRIVE TO BOOT IN NEW SYSTEM. WHEN BOOTED ITS STUCK TO MAKE INSTALLATION AFTER WHEN I CHECKED THE PEN DRIVE IT SHOWS 4MB AS A TOTAL CAPACITY. I HAVE FORMATTED AND AFTER USING THIS SOFTWARE TOOL I CANT RESTORE THE LOST MEMORY SPACE.CAN ANYONE FIND THE SOLUTION PLEASE SHARE TO THE MAIL ID: tata171192@gmail.com or tatad.tata4@email.com. My flash disk is Transcend with 4 GB. Someday, the capacity dropped to be 0,7 MB. 1) With USBView software, I took code of VID and SID to got a recomendation tool from flashboot.RU. From the site, I downloaded and used a alcor version. Not bad, I got the capacity to be 1,32 GB. Latest time, I used a software from flashboot.ru again and again (repeat formating using one software/plug-replug method). in this moment, the capacity to be 1,65 GB. solution for me, maybe, not same your solution. So, someone can try it. and good luck! Dude you saved my life. Great job! i did as instructed it says congratulations! but still the size is 4MB. my drive is toshiba 8GB..so what seems to be the problem? HELP!